Write your story, share your link, and give at least three comments to other Slicers. 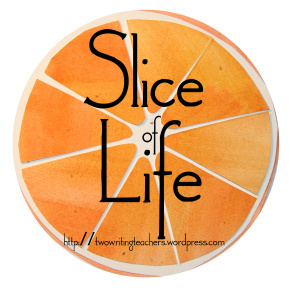 If you’re sharing your Slice of Life Story on Twitter, please use our new hashtag, #sol15. We would like Two Writing Teachers to stay true to its mission as a place where educators who are passionate about writing can gather inspiration and share ideas. We value your participation and encourage you to comment on all our posts, and especially to comment on each other’s Slice of Life Stories. 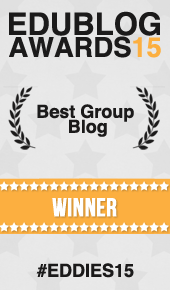 However, we may at any time remove a comment from our blog if it is inappropriate. Please refer to these guidelines when commenting. Self-Promotion: Please don’t use your comment or link to your blog for self-promotion. The links in the comment section of our Slice of Life Story Challenge are meant to lead our readers to stories from people’s lives–not just whatever was on your blog that day. Linking and Running: Please do not just drop off the link to your Slice without commenting on at least three other Slice of Life Stories. Comments are the foundation of this community. If you choose to link early in the morning, please return later that day to leave at least three comments. Spam: It’s not just big advertisers who spam. Spam can include: Copying and pasting a comment from one post to another, or leaving a message such as, “Nice post. Visit my blog at…” This kind of comment is a form of spam. We reserve the right to delete comments that fall into this category. Thank you for appreciating and standing by our guidelines. We want to make Two Writing Teachers a place for information and participation. Keep those comments coming! Wow. Deep thinking of a five year old. Day one arrives and I wax sentimental! Some folks are having the bad weather: we’re having bad bugs – the flu kind. My husband’s new hours at work sure effect my routines. Great day, long day, worth writing about. Thank you for the space to share. Thanks for a great chat last night! A gift from the blizzard! First time trying this, writing about a task I thought would be tedious, but ended up being very relaxing. At the beginning of a 10-month course I had to do an introductory drawing activity. Not my favorite task. A snow story … of course. A teacher’s anxiety turns to a meaningful experience. I need to get ready for a test next week. A few inspiring quotes…….. Have a great Tuesday! I missed last week so I’ll cheat and add last week’s post as well…. So glad my evening settled down in time for the TWT Twitter chat. But it sure was nice to have a good laugh before that. So many wise folks in this community!! What does snow mean to you? Fun? Tons of extra work? Relaxing? Reading/Writing more? Happy Tuesday everyone! May it be filled with lots of slices! Sharing how sliding paper under a door brought peace, safety and refocus. On football, picture books, and why I am grateful for my husband. An early morning post – I’ll read and comment on others’ later! Took advantage of a snow day to literally map out my writing process with interesting results . . .
Loving the singing…helping me with slicing! Stay warm & safe, everyone! Not sure this am why I am having trouble with activating the link. Here is try 3..I hope it is a charm. I have very much enjoyed the posts I visited this morning. Thanks fellow slicers!